Reproductive Biology of the Great Apes: Comparative and Biomedical Perspectives discusses the great ape reproduction. The book opens with the menstrual cycle of apes as a good foundation for the subject areas that follow. Accordingly, Chapter 2 focuses on the endocrine changes during the stage of pregnancy among apes, specifically the hormonal changes in chimpanzee. Chapter 3 deals mainly on the condition postpartum amenorrhea. In Chapter 4, the reproductive and endocrine development – from fetal development, infancy, juvenile, to puberty – is discussed. Chapters 5 and 6 thoroughly discuss the female and male ape’s genital tract and their secretions. The sole topic of Chapter 7 deals mainly with the comparative aspects of ape steroid hormone metabolism. Meanwhile, Chapter 8 tackles laboratory research on apes’ sexual behavior. The succeeding chapters talk about the chimpanzee, gorilla, and orangutan reproduction in the wild. Chapters 12 and 13 basically look upon the behaviors of the great apes, specifically intermale competition and sexual selection. The next chapters (14 and 15) look at the necessity of breeding and managing apes in captivity to ensure their continued survival. 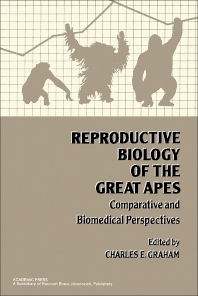 Lastly, Chapter 16 highlights the significance and great value of apes as models and comparative study in human reproduction. This book will be of great use to human physiologists, comparative anatomists and zoologists, primatologists, ape breeders, and biomedical scientists. II. What Is Sexual Selection? V. What Can the Great Apes Tell Us about Man?